A new model of SynFlash is in the planning stages. If you would like to know more please send us an email. We have dozens of satisfied SynFlash customers in the US, Great Britain, Canada, France, and Denmark. SynFlash genlocks to all of their HD standards. New firmware is available as a free download for all SynFlash owners. Version 2.0 and version 2.2 were released on Feb 15, 2011. Version 2.0 runs on all original SynFlash models. Version 2.2 requires a hardware modification. Visit the download page. A Windows computer with 9 pin serial connection is REQUIRED to install either firmware update. We can install the update for the cost of shipping. See what is changed by this update. Where is the guarantee? You know, the guarantee that your audio and video are in sync, that they were captured in sync? Take a recent example. We were watching an edit of a guy talking. His lips were moving but the sound was out of sync. No two ways about it, the sync was bad even though the editor's software claimed his audio was locked, just as it was captured. Regardless, our eyes told us the audio was NOT in sync. Was the camera at fault? His edit application? Operator error? So, about that guarantee...of course the CAMERA keeps audio and video in sync, right? Maybe not. Although it is natural to assume audio and video are recorded together and magically emerge from your production chain in perfect synchronization, there are no guarantees. We have often seen problems similar to the one above. If that interview footage had included a shot of SynFlash, and checked immediately after digitizing by the editor, the problem could have been found and fixed before becoming a problem! Are you making live television? Have you noticed how often live television broadcasts appear out of sync? It makes us scream at our television sets sometimes. Sync can be lost at so many points during the production of live broadcasts! Sometimes shots receive several types of video processing, being delayed by varying amounts at each step (almost always in multiples of frames). The same can be said of audio even if the audio processes do not always demand as much latency. Put it all together and the number of variables can be astounding, making mental calculations onerous, or useless. Eventually audio and video emerge from your line of production trucks only to be sent around the world on different paths! Audio might go to the left while video goes to the right, and arrive at its final destination out of sync! SynFlash is designed for the craziness of live television, to be quick and easy to use. A couple of seconds holding SynFlash in front of a camera, and checking the feed before it hits the viewer, could make a huge difference! Obviously sync problems should be tackled before you shoot, not during audio post (if there IS any audio post). What you want is something that is easy, fast, and efficient, to help you before your shoot as well as long after during post. 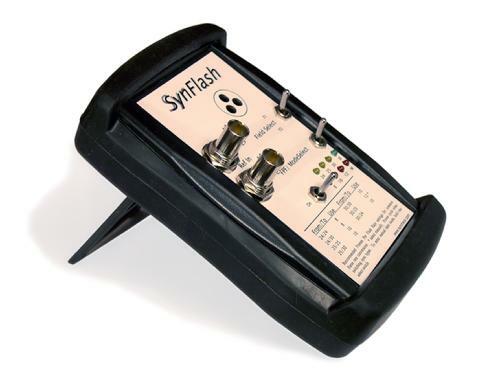 SynFlash is simple, quick to set up, and amazingly effective. It generates visual flashes and audible blips at intelligently selected rates, precisely locked to your video reference. When paired with SyncheckII�, you can discover exactly where your audio and video are falling out of sync! SynFlash is designed to be effective even during frame rate transfers. Do you shoot at 24p but edit at 30i? How does your audio/video sync hold up in the edit suite, in an audio mixdown, on the air? 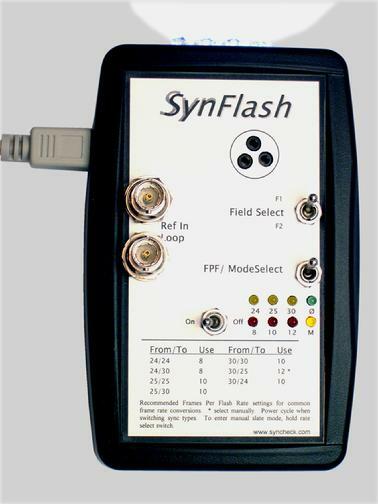 SynFlash with SyncheckII� will show you quickly and accurately.